Removal of minor skin irregularities is now fast, easy, and affordable! Skin growths are accumulations of various types of cells that look different from the normal surrounding skin. They may be raised or flat and range in color from dark brown, black, flesh-colored, or red. In most cases, skin growths are non-cancerous and can be safely removed using light energy (laser) or electrical energy (Hyfrecator). A Hyfrecator is an electrical treatment device that has been successfully used for over 30 years by skin therapists to remove common surface skin growths. The device uses high-frequency electrical currents that delivers precise electrical sparks through a micro needle electrode at different amplitudes to dehydrate a skin growth. At almost all times, the needle remains above the skin surface and the current sparks across the gap causing dehydration of the skin growth. As the growth is removed, a natural protective coating of a scab develops that covers the treated area. There is no blood associated with the treatment. Once the scab comes off, the treated area will heal and new healthy skin will return and gradually take on the color of the surrounding tissue. In most cases, there is no visible indication of the previous growth. 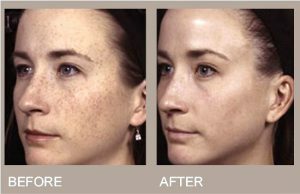 Once a skin growth has been treated with the Hyfrecator, it does not return. However, if your skin is prone to these type of growths, new ones may appear elsewhere on your face and body.